A carved Vicenza stone gazebo with six plain columns, simple capitals and bases for garden use. In this a particularly elegant Gazebo with no decorations on arches and a wrought iron dome pierced with scrolls on top. Gazebos have been recorded as far back as 3000 BC, with the structures appearing in the garden spaces of royalty in ancient Egypt. They were also fixtures in ancient Rome, Persia, England. Early gazebos were made of stone or rock as well as wood, and rough logs were used in some cases as well. Their popularity increased in America in the middle of the 19th century with the rise of the upper middle class, and they have appeared steadily since. 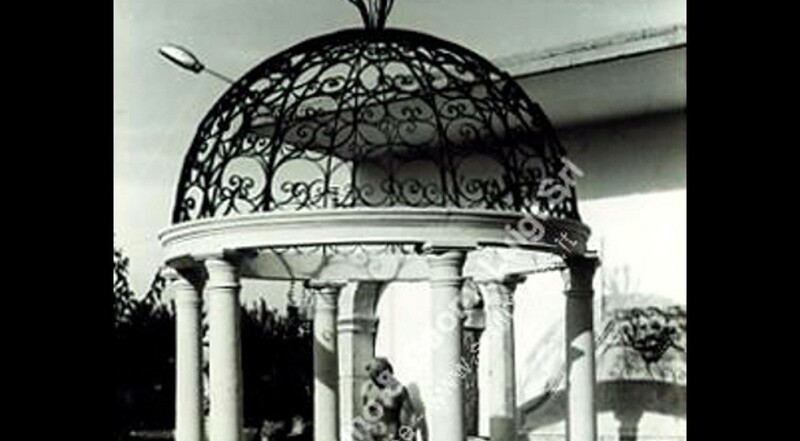 Our stone gazebos are hand crafted and finished with wrought iron domes finely decorated with floral or allegorical motifs. Garden furniture special and unique because they are made entirely by hand by our sculptors. Browse just some examples of gazebos made in our atelier or contact us to give shape to your ideas and make the gazebo of your dreams become real!